54451: 10-12 Dodge Ram HD Upper Class One Piece Chrome Mesh Grille. 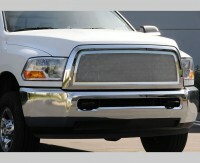 Give your Ram truck a new and unique custom look with this high quality one piece stainless steel mesh style grille. Comes finished in sparkling mirror finish chrome for an outstanding look. Installation instructions and hardware are included. Installation time is about 1hr. Requires modification to OE factory grille. Backed by manufacturers five year warranty. Made in USA. Tell your friends about the Chrome Upper Class Mesh Grille (1pc). Share this product on Facebook, Twitter, MySpace or send an email to a friend!